Is Barbera feminine or masculine (grammatical gender)? 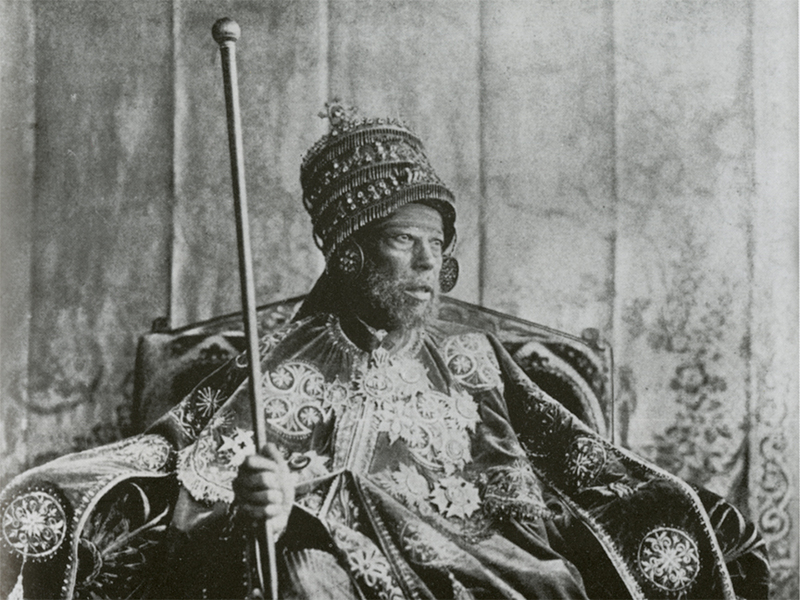 And why is there a photo of the great Ethiopian Emperor Menelik II on my blog today? Is Barbera (the grape and wine) a feminine or masculine noun? In other words, what’s its grammatical gender? Is it correct to say la Barbera or il Barbera? Believe it or not it’s an orthographic that comes up frequently in Italian winespeak. The Barbera d’Asti Consortium published my post answering the linguistic conundrum this week. My research for the post led me to dig up my grad school notes on the great Italian poet, scholar, and critical theorist Giovanni Pascoli. And one of his poems led me to the renowned Italian soldier and patriot Giuseppe Galliano (the one the liqeuer is named after). And that led me to the great Ethiopian Emperor Menelik II (1844-1913) (above). Galliano died at the Battle of Adwa (1896) where Emperor Menelik defeated Italian imperialist forces led by General Oreste Baratieri. The biography of the Ethiopian ruler is as fascinating as it is thrilling: he was a brilliant military strategist and he became the first Africa ruler to repel European colonialism. The Italians’ defeat at Adwa stunned the world and Menelik became an icon of African and African-American independence. Read my post on Barbera’s grammatical gender here. Next week, I’ll translate the poem (which also fascinated me) in its entirety with a brief critical apparatus. Parzen family made it home from Italy safely and soundly last night. 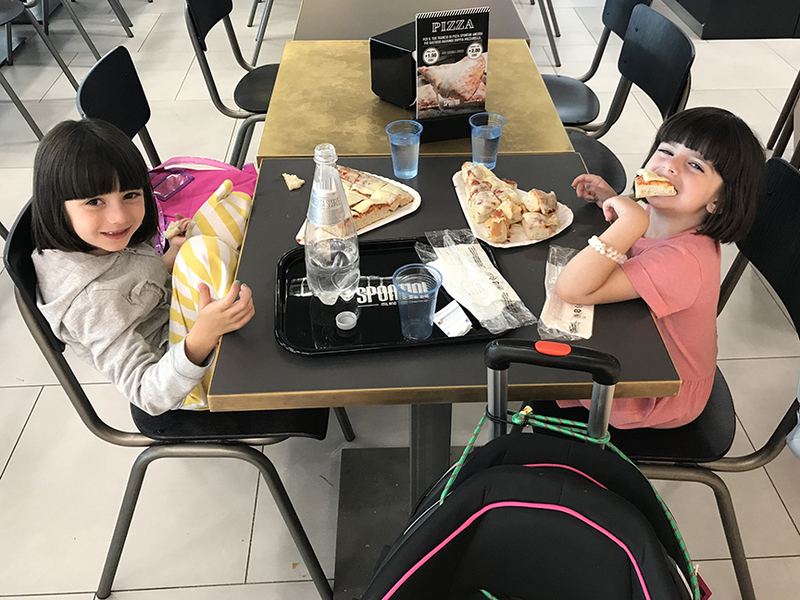 Georgia and Lila Jane (above) enjoyed one last taste of pizza yesterday morning for breakfast at Malpensa airport outside Milan. The ladies at the food court were so sweet to them. It was a wonderful coda to our stay in a country where children are universally adored. Both girls were extremely well behaved on our flights and both were overjoyed to sleep in their own beds last night — as were their parents. Thanks again to all of our friends who made the trip so fun, special, and memorable. It was a really great one. Top image via Wikipedia Creative Commons. Arrivederci, Italia! Thank you for treating our girls so well! It’s been a wonderful three weeks in Italy with our girls, ages (almost) five and six and a half. They’ve been trying all kinds of new foods (Lila Jane now loves rabbit; Georgia has a yen for fried anchovies) and picking up Italian words along the way (Georgia can now count to 13 in Italian; Lila Jane’s grazie is impeccable). 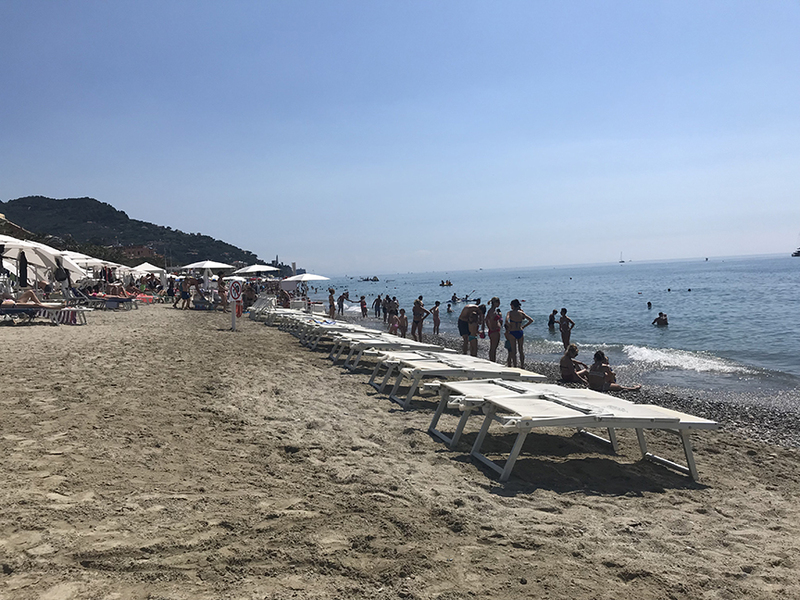 They’ve made a ton of friends here: Cecilia, Tiziano, Lorenzo, Federico, Andrea, Alba, Azzurra, Atena… too many to count. And they played with kids from all over the Mediterranean. Their mother and father have been eating well, too. 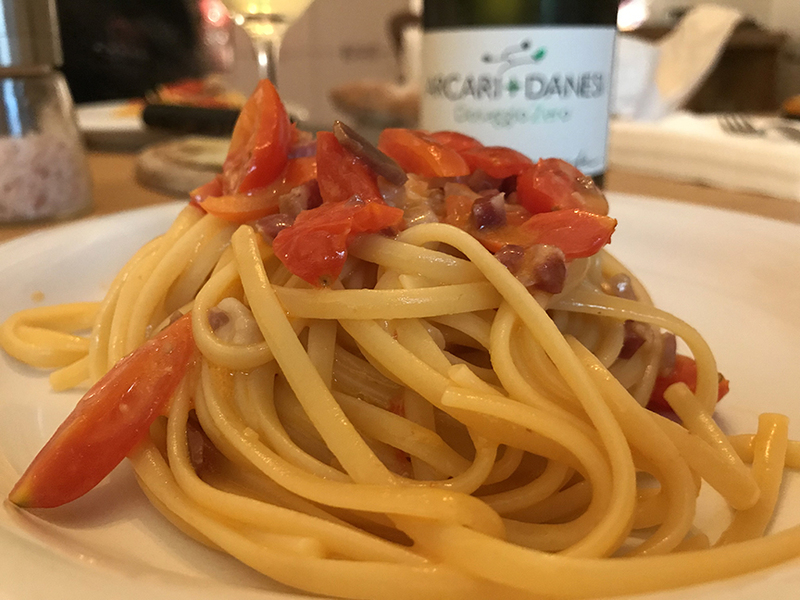 Our host (and the best friend you could ever ask for), Giovanni, made us delicious linguine with fresh tomatoes and coppa last night (above), a perfect pairing for his Franciacorta Dosaggio Zero (Arcari + Danesi). Other highlights were fish stew in Liguria, a cow-goat hybrid Robiola paired with Nebbiolo in Piedmont, spaghetti with clams at Giancarlo and Francesca’s house (Piedmont), erbazzone and homemade salame on Michele and Vanina’s farm (Piedmont), aperitivo with the Lini mispucha (Emilia), tortelli verdi with the Levy clan (also in Emilia). 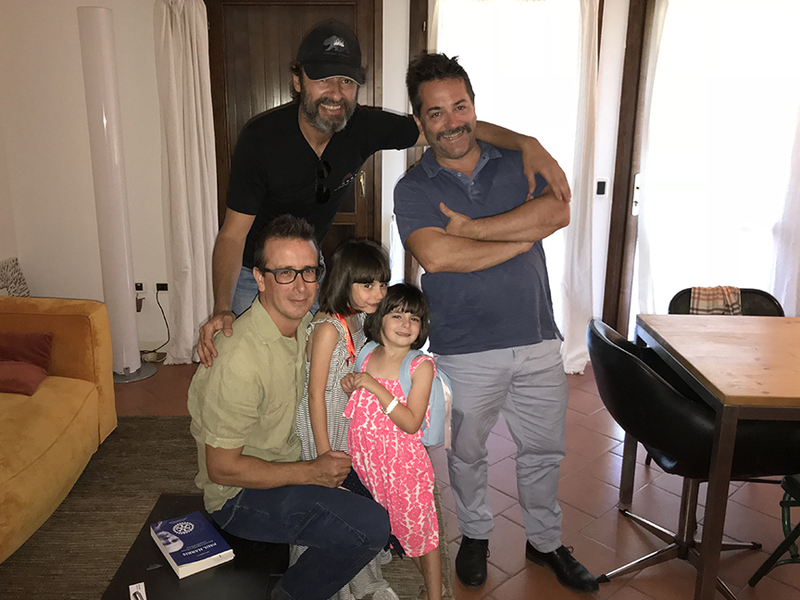 Another highlight was a vineyard picnic on Sunday with my dissertation advisor Luigi and his son Edoardo, also a great friend of mine. 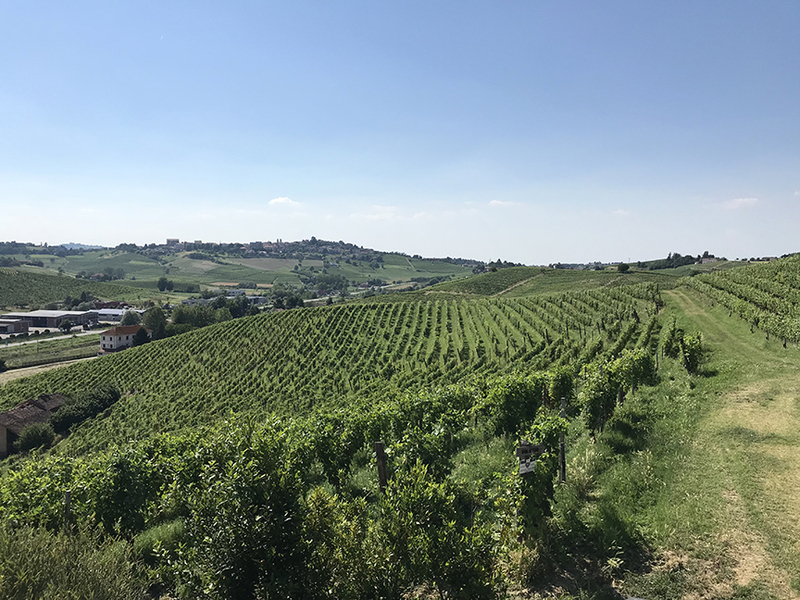 We were the guests of the Arcari + Danesi winery in Coccaglio (Franciacorta, Lombardy), where we enjoyed perfect weather, wine, and a paradisiacal Bagòss. And that brings me to the best part of all — loving and being loved in return. That’s Giovanni in the photo below (top, left) with Nico (his partner at Arcari + Danesi, top right), and Andrea (their partner in SoloUva, bottom left), Georgia (center) and Lila Jane (right). 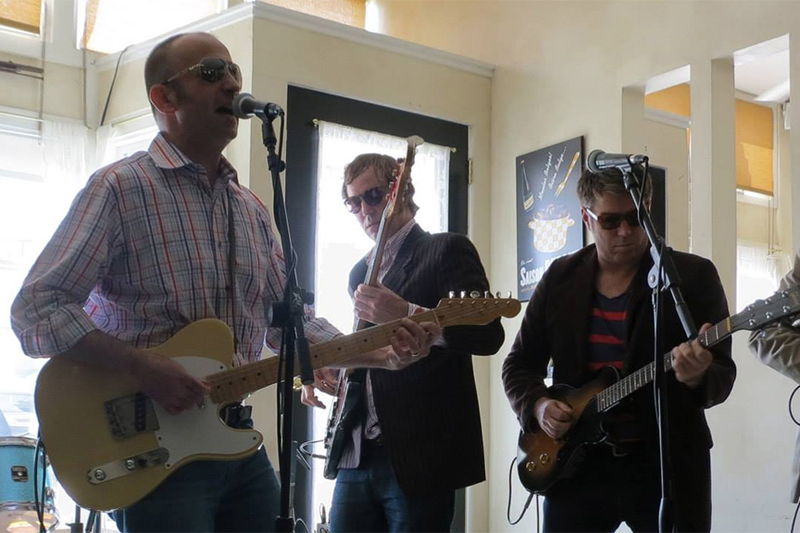 The guys did everything in their power to make sure that the Parzen family was comfortable, safe, and well fed. By the time we said goodbye this morning, the girls were playing with them (and on them!) like they were uncles — my Italian brothers. Words cannot express how thankful I am to them for everything they did for us. Just knowing they were there for us in case we needed them made the trip all the more relaxing and enjoyable for Tracie and me. Not many can boast of having such loving, lovely, and generous friends. We’re so lucky to have them in our lives. Many tears were shed as we all said goodbye this morning: dew cascading gently from a grape bunch as the sun rises over Montorfano. Arrivederci, Franciacorta! Arrivederci, Italia! We have loved you as you have loved us. 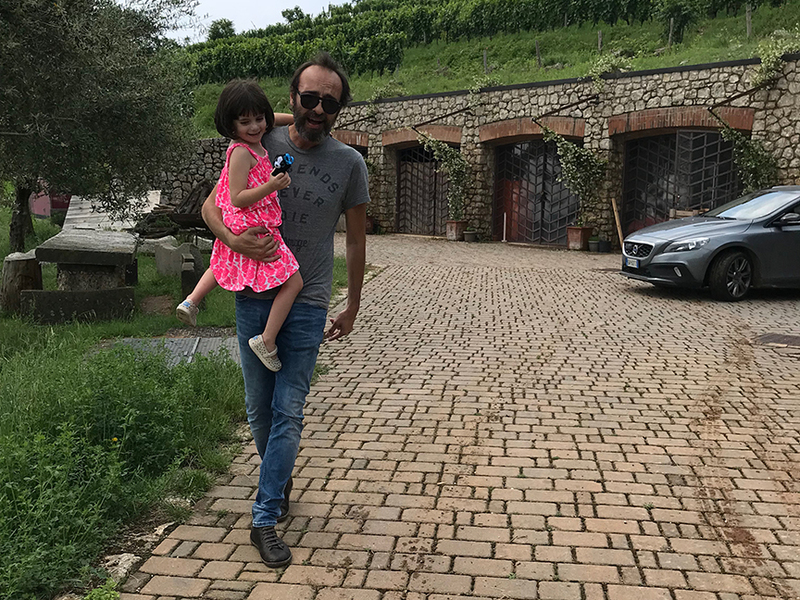 Yesterday Parzen family spent the afternoon meandering through the Michele Chiarlo winery’s Parco Artistico La Court in Asti province with Stefano Chiarlo. Lila Jane and Georgia, who had been complaining about the hour-long drive from Bra in Cuneo province (“daddy, this is taking forever!”), literally bounded out of their car seats and headed straight for the park’s observation tower. 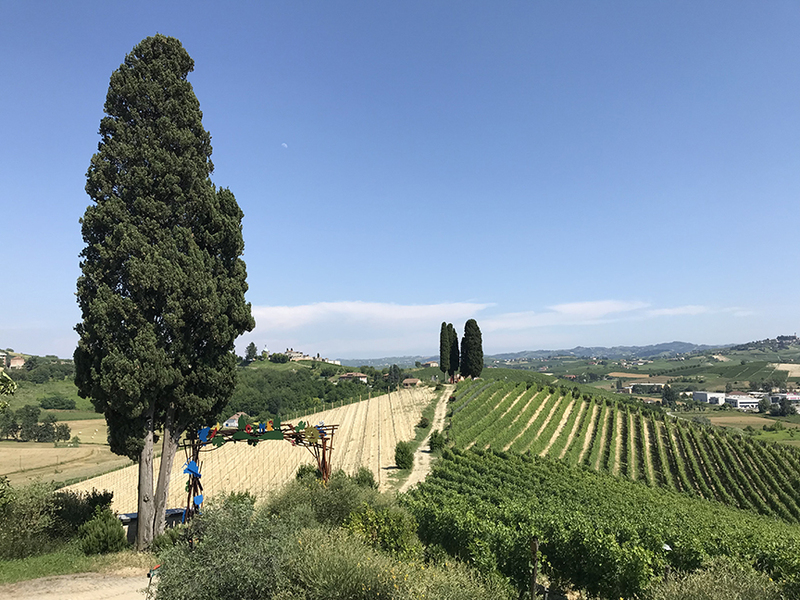 It was a clear, beautiful, but hot day in Barbera vineyardland yesterday. 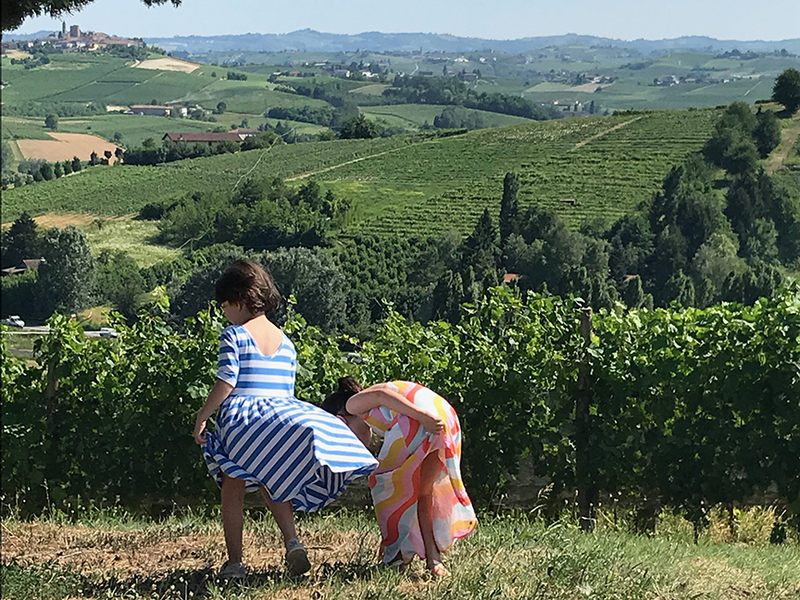 Atop Chiarlo’s Cascina La Court, a cool breeze gently soothed their cheeks as they marveled at the newly born bunches, still green only a few weeks after fruit set. Any keen observer of grape growing would remark on how wild Barberaland is and how the vines don’t have the manicured look of their counterparts in Nebbiololand. The farming there alternates with woods and other crops and many growers have shifted to organic practices like Chiarlo, said Stefano. That’s Stefano as he showed us the apotropaic totems mounted on each of the rows. His family’s park is open to the public throughout the day and the winery will organize picnics and tastings by appointment. But everyone is welcome enjoy the estate, any time of day, he said. There are works of art by contemporary artists installed across the park. And there’s even free wi-fi. “Hills, that’s what makes Italian viticulture unique,” said Stefano as he waxed agronomic (he’s the family’s vineyard manager). Our girls couldn’t agree more. 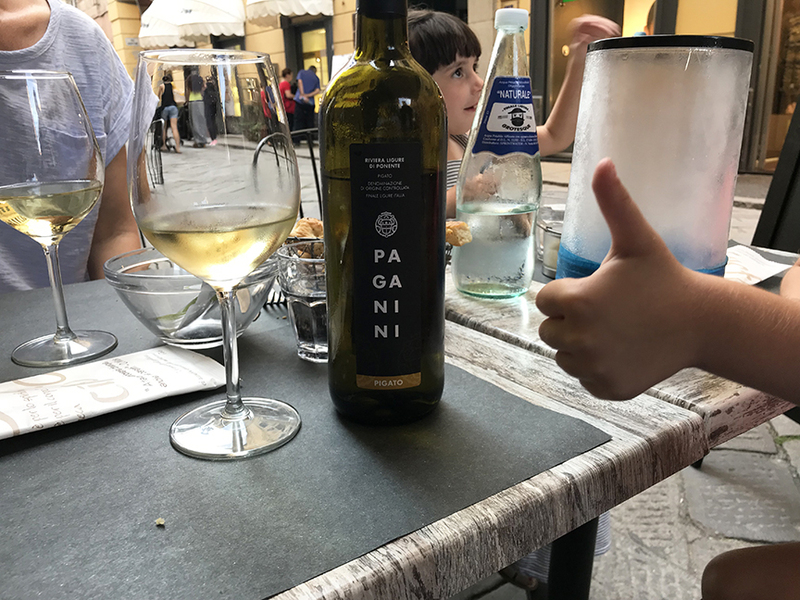 Americans often claim that the wine just tastes better in Italy. 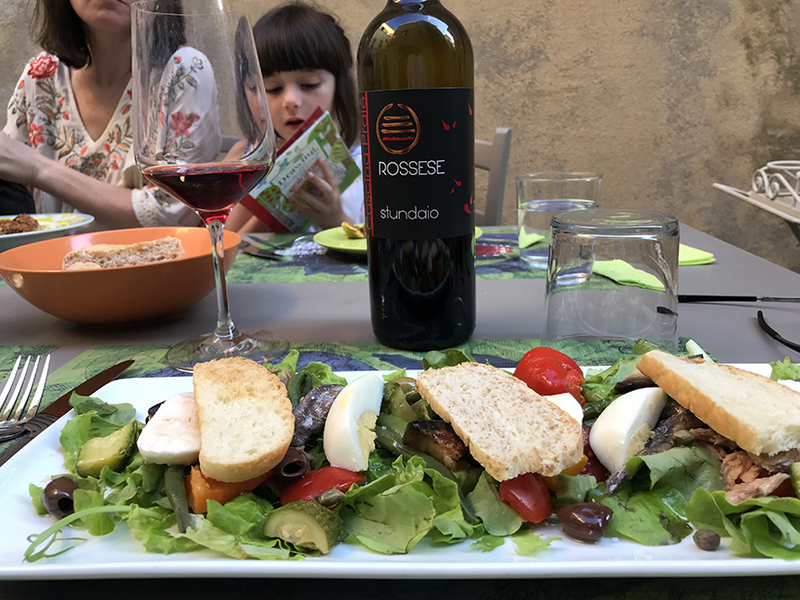 Considering how few bottles of Rossese seem to make it to the U.S., he may have a point. The enigma of the wine well traveled may never be solved… but Tracie and I thoroughly enjoyed the Cascina Praié Rossese Stundaio that he poured for us on Saturday night in the ancient city overlooking the riviera in western Liguria. With zippy and balanced acidity and restrained alcohol, this wine was electric and lithe with bright berry fruit and Mediterranean scrub. Served room temperature, it paired gorgeously with the condiggiùn in the photo above (condiglione in Italian, the Ligurian niçoise). It was equally delicious with fried anchovies and fish stew. I couldn’t recommend Ai Torchietti highly enough and I’m looking forward to trying the sister fine-dining concept Ai Torchi the next time we can visit. Paganini Pigato was another wonderful discovery at Osteria Grotesque in the beachside village of Finale Ligure. This food-happy wine had the mouthwatering minerality and classic muted yellow fruit and gentle almond notes that you find in old school expressions of the variety. It was recommended to us by the young man who was running this popular restaurant on Friday night. He and the server working the floor of this tiny spot were so kind to our family. You don’t always find such nice people in jaded seaside towns brimming with tourists. These guys were the best. Those are Osteria Grotesque’s antipasti above. We loved the place and we loved the people- and dog-watching (be sure to get there early to snag an outdoor table as we did; we ended up staying all night, with the girls playing with other children in the pedestrian-only street long after we finished eating). All in all, Parzen family had a magical micro-vacation before returning sun-tanned and sandy to Bra in Piedmont where I have a heavy teaching load this week. 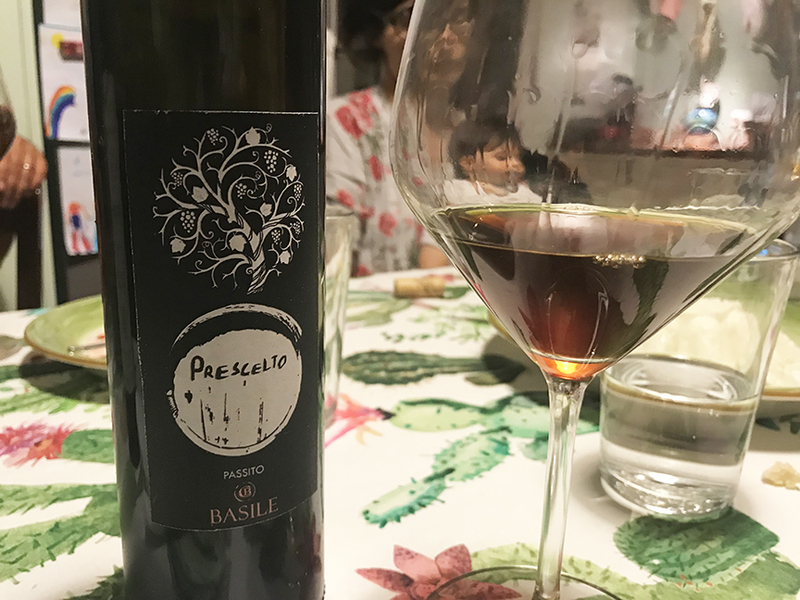 Tasting this superb bottle of Passito di Pantelleria “Prescelto” 2008 by Cantina Basile the other night, the expression “sticky wine” came to mind. But not because the wine was sticky. The opposite was true: it was so lithe in the glass that it drank more like a classic white wine in terms of its texture. The alcohol and acidity were so well balanced that its sweetness never felt overwhelming or pervasive on the palate. The other thing that really impressed me about this truly extraordinary wine was its spectrum of primary, secondary, and tertiary aromas and flavors (I know, I know… I don’t like those terms either and they sometimes mean different things for different people. But it’s really the best way to describe this remarkable wine). As the Italians like to say, you felt like you were chewing the fruit, dried fruit, and almonds in this wine. It really blew me away. And it was made all the more special and memorable by our gracious hosts and the delicious meal they prepared for Tracie, me, and our girls. 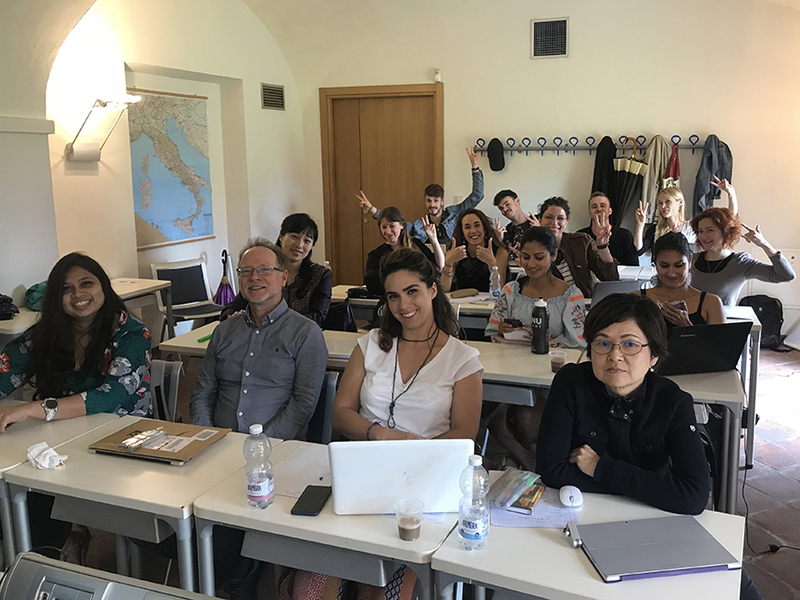 It’s been a busy week of seminars with my students in the Master’s of Wine program at the Slow Food University in Pollenzo (Piedmont). 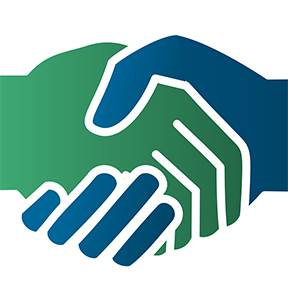 It’s my third year here as an adjunct and I love the interaction with students and the high level of discussion and dialogue. Lisa Perrotti-Brown’s post on “The Big Parkerization Lie,” published earlier this week on Wine Advocate, couldn’t have been more timely or relevant as we’ve discuss books by Lawrence Osborne, Eric Asimov, and Alice Feiring. It’s incredible to think that more than 10 years after Alice’s book, the debate over Parker’s influence and impact still marches on. The students really surprised me with the insights and experiences they shared. A really great group this year. But then again, each class of students seems to have its own unique take on the world of “wine communication” (one of the subjects I teach). 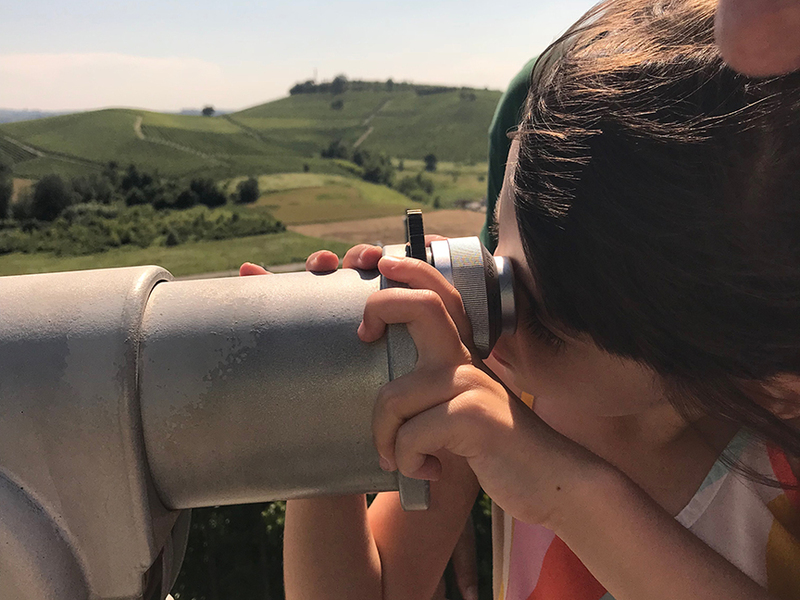 The other really fun thing this week has been watching our daughters as they discover the sights, sounds, and flavors of Italy. They’ve both been really adventurous about trying new foods (although the snails didn’t go over so well last night!) and they’ve both been making a college effort to speak a little Italian. It’s a dream come true for Tracie and me. We’ve been having so much fun and tomorrow I’ll take them to the beach for the weekend. Tracie and our girls have been with me in Italy for the last five days. It’s been really wonderful to have them here. I’m teaching at the Slow Food University in Piedmont this week and next. They’re on vacation. The food has been great and they’ve been having a blast. But the most rewarding thing has been watching our girls — ages 4 and 6 — explore a vineyard. 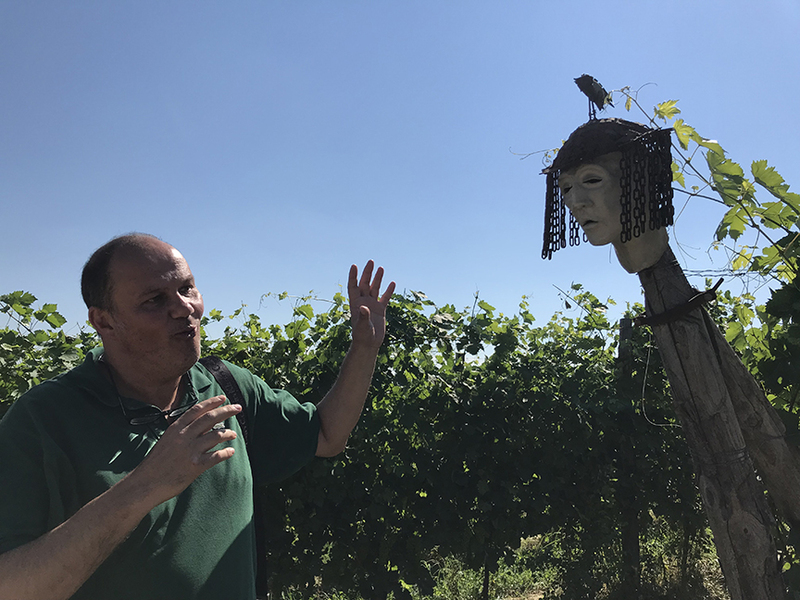 That’s Giovanni above, the most generous friend you could want and a brilliant grape grower and winemaker in Franciacorta (where we stopped on our way to campus). And that’s Lila Jane, our youngest, in his arms. She spent the better part of an afternoon with her sister Georgia picking flowers and chasing butterflies in his vineyard. 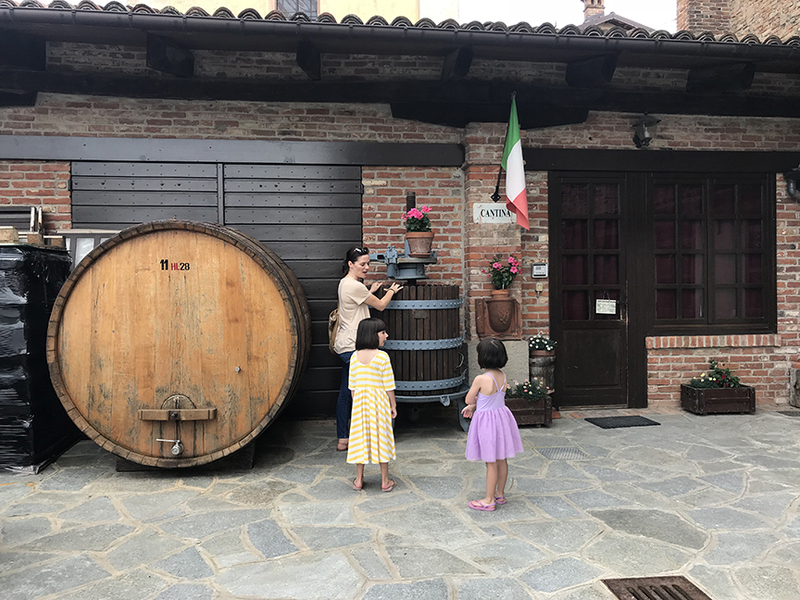 And that’s Tracie, showing Georgia and Lila an old wine press outside the winery at the Castello di Verduno. 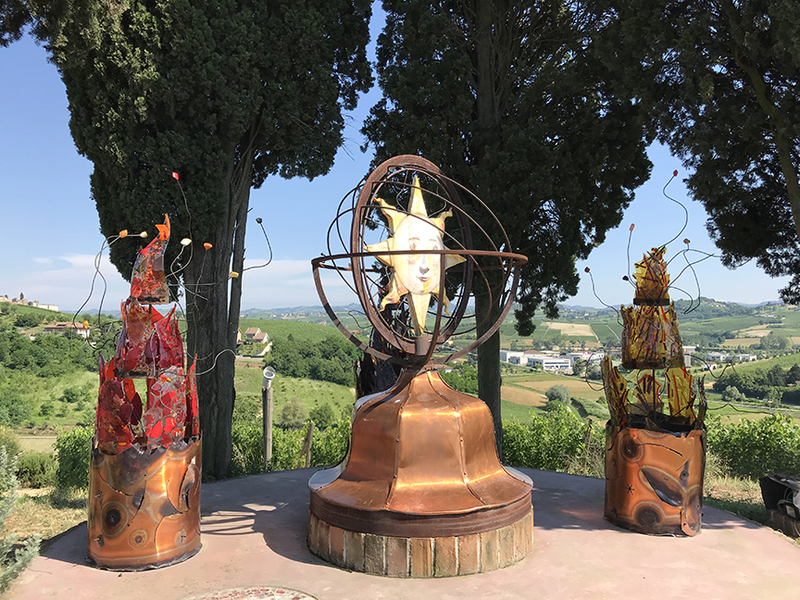 We had such a magical visit there, enjoying the garden and the view at the Real Castello. “How do grapes turn into wine?” asked Georgia. How do you explain a miracle to a child? One of the words Tracie’s taught them is vigna. It’s been a fantastic trip so far and I know many discoveries and adventures await them. The fig tree putteth forth her green figs, and the vines with the tender grape give a good smell. Above: when I first started coming to Italy 30 years ago, bacon was still called pancetta. Now it’s called “bacon” in Italian. 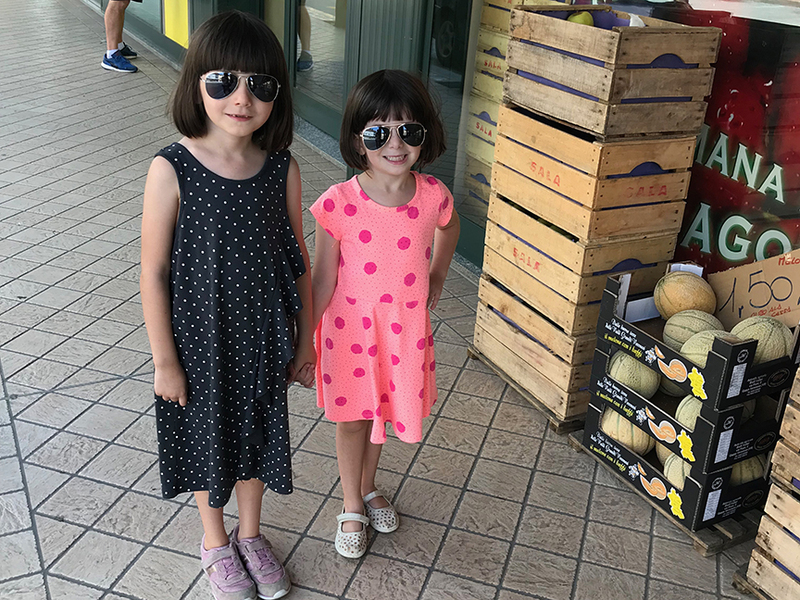 Tracie and I landed in Italy yesterday with our daughters, ages 4 and 6. It’s their first real trip to Europe (since our oldest doesn’t have any recollection of our visits here when she was just one year old; and our youngest only made it here previously in utero). 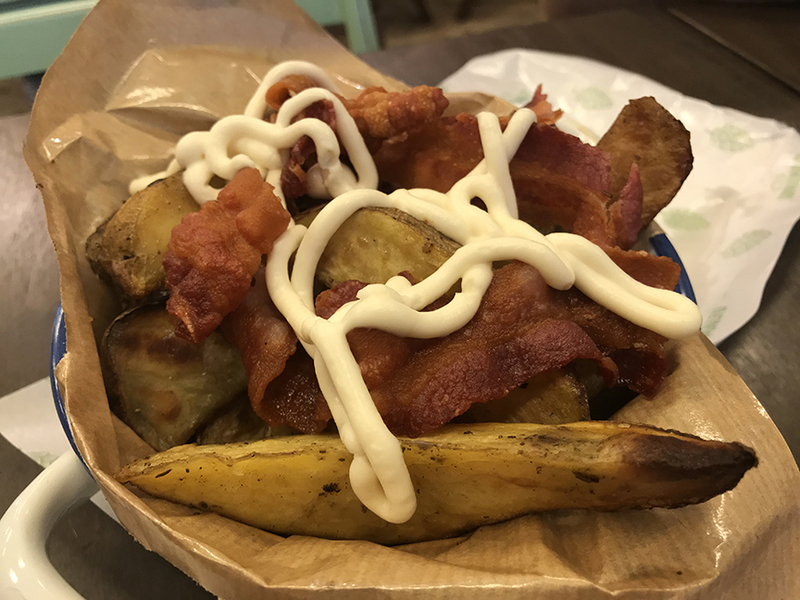 When we told them about our summer trip this spring, they were concerned — gastronomically speaking. “They have LOTS of good things to eat in Italy!” Tracie and I laughed and smiled. Above: bacon and eggs is now commonly found on menus in northern Italy. 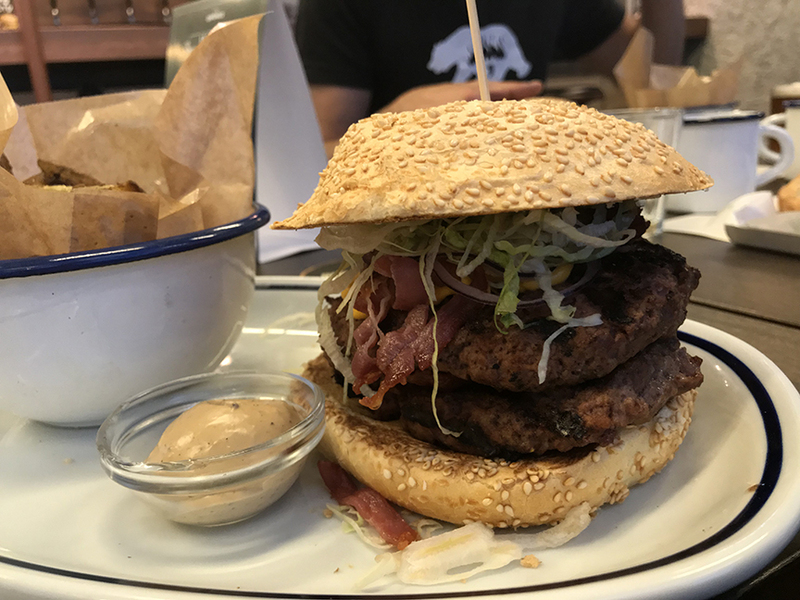 It must have been seven or so years ago when my Italian bromance Giovanni took me out for (truly excellent) hamburgers and I noticed that the cured pork belly was cut and smoked not like traditional Italian pancetta but like American bacon. 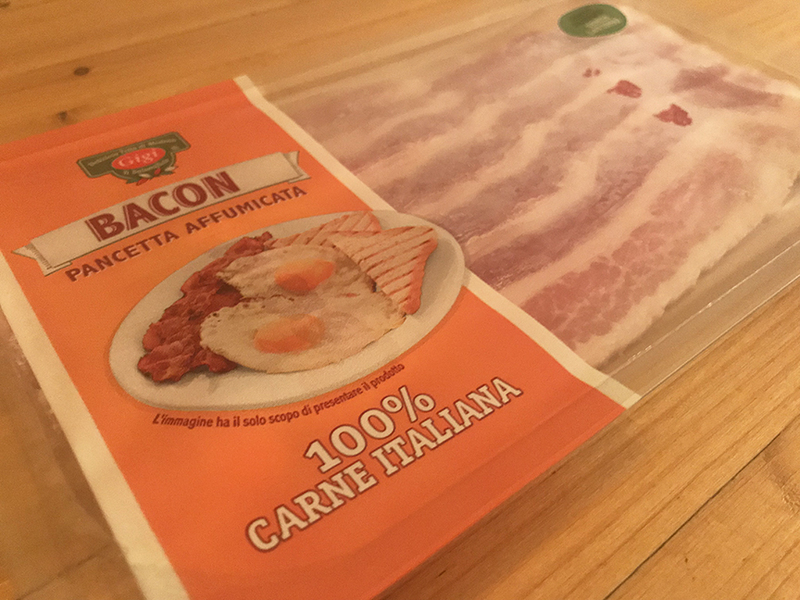 In the time since, “bacon” — as it is now called in Italian — has become ubiquitous in northern Italy. Above: a hamburger I ate last month in Franciacorta. Note the bacon. Italians love LOVE hamburgers. They love them so much that they don’t use butcher scraps to form the patties. They use the highest quality beef they can find. And beyond the myriad fast food restaurants that now sadly dot the northern Italian countryside, the omni-present amburgheria (hamburger house) never uses the hydrogenated-oil buns that we adore in America. Instead, they use artisanal buns. I’ve had some of the best hamburgers of my life in Italy in recent years. And that’s coming from an all-American, huge bacon-cheeseburger fan. 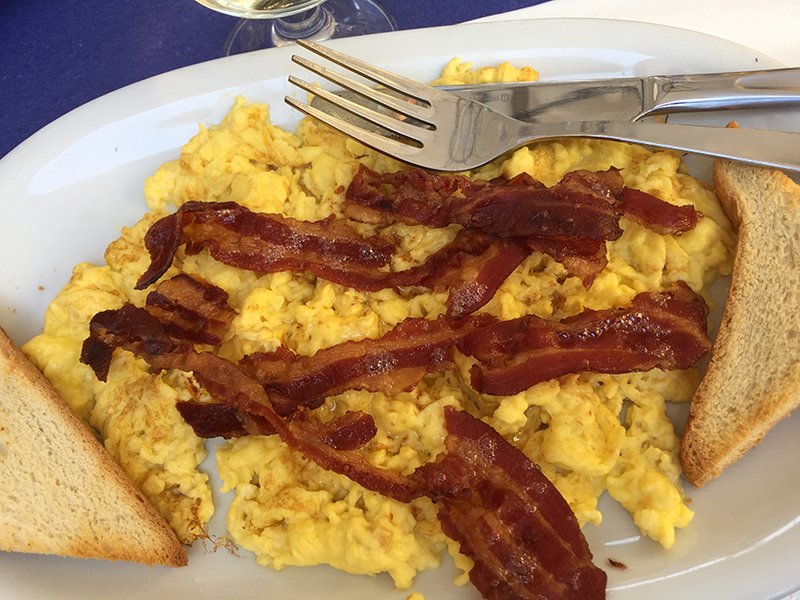 Bacon and scrambled eggs are also immensely popular now in northern Italy. 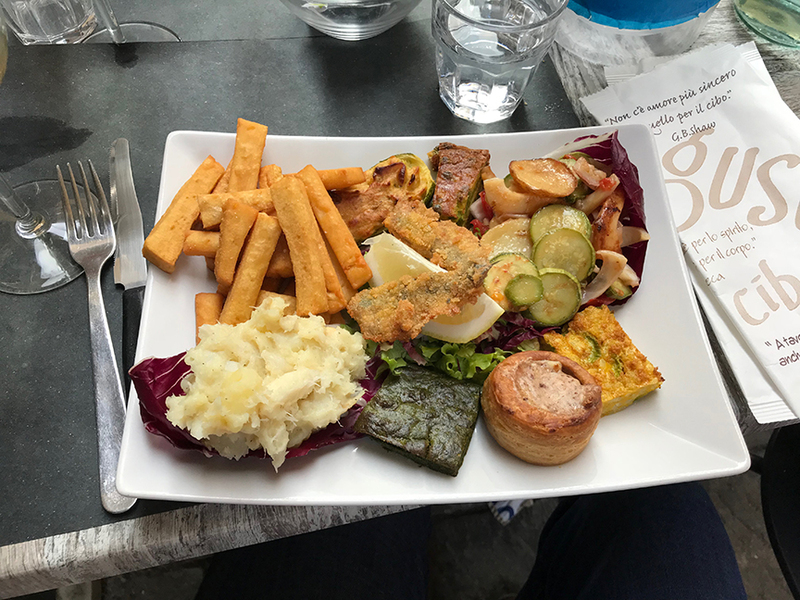 Two years ago, I snapped the above photo of the dish in a run-of-the-mill trattoria in downtown Milan, ordered at lunch à la carte. Above: bacon fries with Pecorino sauce (no joke) at the same amburgheria in Franciacorta. Giovanni is graciously hosting our family this month at his place in Franciacorta. And being the generous and thoughtful friend that he is, he went grocery shopping for us before we arrived. The bacon in the top photo is awaiting our girls in his fridge as they slumber. Back at home, we spend SO MUCH money on high-quality, wholesome bacon. Here in Italy, even when they cut the bacon from top hogs, the price is still very reasonable. Leave it to the Italians to “misunderstand” American cuisine and make it all the better along the way. My only worry is: will our children ever want American bacon again? 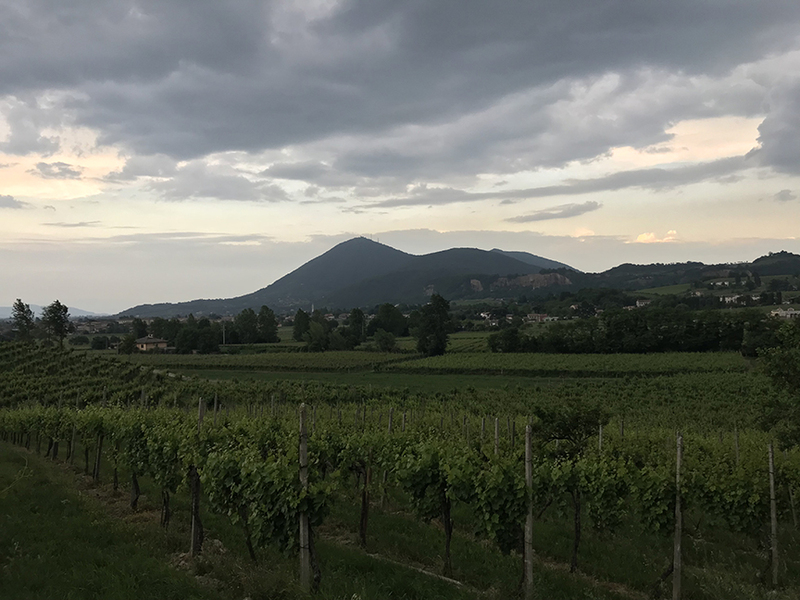 We arrived safely and soundly yesterday afternoon in Milan and made our way to Franciacorta before the heavy rain began to fall. The girls have already spotted their first bunnies outside of Giovanni’s apartment and they loved the fresh fruit that Giovanni’s mom had prepared for them. Aside from a lost bag (mine, thank goodness, not Tracie’s with all the girls’ things), we’re already having a great time. Thanks for reading and buon weekend a tutti! Above: An early 16th century medical manual lists barberry lozenges as a commonly used cure. In today’s world of hypercorrective ampelography, it’s hard to believe that people didn’t used to care as much about grape names as we do in the contemporary age. Writers on agriculture didn’t began to record grape variety names on a wide scale until the latter half of the 19th century. And even those early modern ampelographers couldn’t rival today’s giddy obsessions with the etymologies of grape names. Contemporary wine writers can’t seem to resist the urge to dip their toes in the etymological waters. And despite their access to Google Books and the growing legions of searchable encyclopedic resources available online, they continue to wax philologic (and errouneous) over the origins of ampelonyms like Sangiovese and Aglianico (even though the former doesn’t mean “the blood of Jove,” nor is the latter a cognate for Hellenic). But in the case of Barbera, Hermes generously let the experts off the hook: Most concede that the origin of this grape name, which didn’t begin to appear in print until the 18th century, is unknown. Ian D’Agata sums up the current state of Barbera philology in his landmark work Native Grapes of Italy (which I highly recommend to you). The origin of its name is unclear; Pietro Ratti of Renato Ratti feels it’s a derivation of barbaro (barbarian) due to its deep red color, while others believe the origin is vinum berberis, an astringent, acidic, and deeply hued medieval drink. 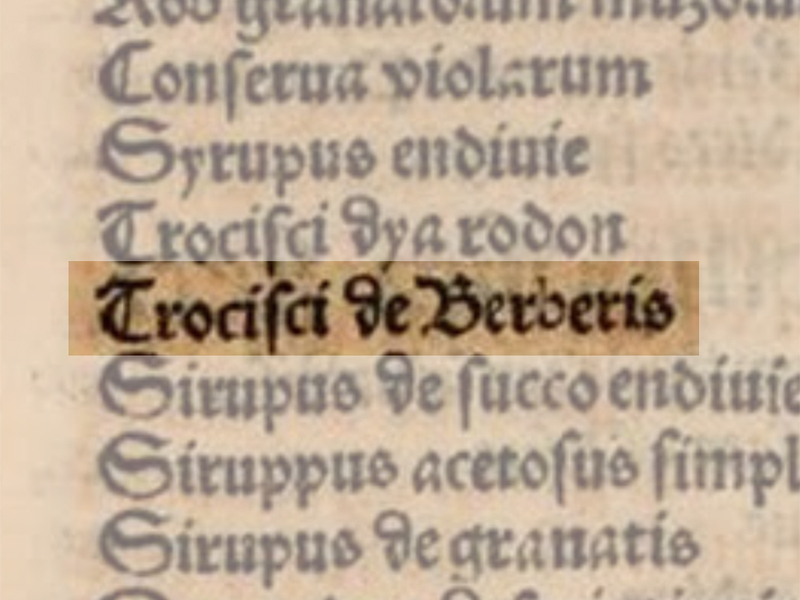 Vinum berberis is different from the vitibus berbexinis referred to in a 1249 document located in the archives of Casale Monferrato, which was most likely another variety, Barbesino or Berbesino, better known today as Grignolino. For the record, vinum berberis was a barberry elixir. And medicinal barberry extract was more commonly applied on a lozenge (a troche, in English, trochiscus in Latin) than in a vinum or wine. 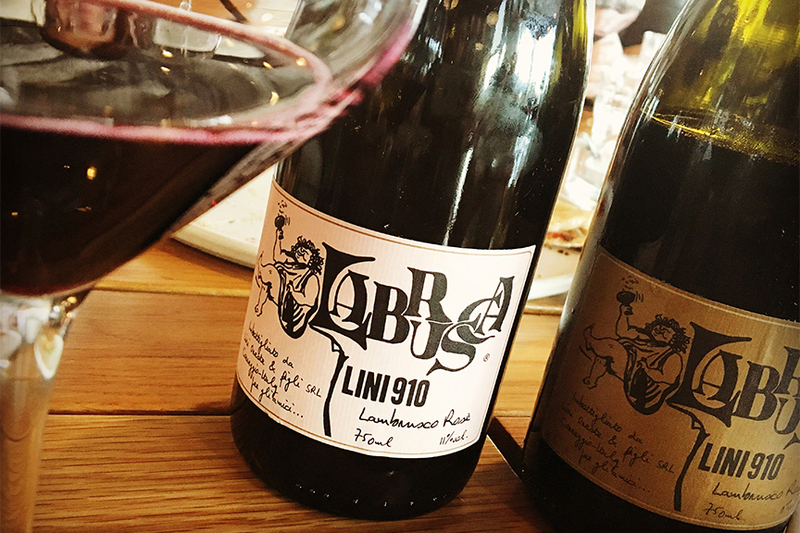 Even when we turn to a more authoritative source, our grand desire to uncover Barbera’s origin story remains unfulfilled. The Treccani Italian dictionary (a benchmark of the Italian academy) offers two possible etyma. The first is the Latin grape name albuelis, notably mentioned in Columella and Pliny. It’s a linguistic stretch, however possible (Barbera could be a metathetical reduplicative contamination). Above: the Euganean Hills where the Italian poet Francis Petrarch (1304-1374) spent his last years transcribing his life’s work. “My Italy, although speech does not aid those mortal wounds of which in your lovely body I see so many, I wish at least my sighs to be such as Tiber and Arno hope for, and Po where I now sit sorrowful and sad” (translation by Robert Durling). The above passage, the opening of the most famous of Francis Petrarch’s political poems in Italian, came to mind last week when I read the news that Italy would have a new governing coalition formed by racists and nationalists. The news also made me think of my dissertation advisor, the Italian poet Luigi Ballerini, whom I recently saw in Milan where he was born in 1940. His earliest memories, he has often told me, are of Nazi soldiers retreating from the city atop their tanks, bare-chested in the heart of winter. Luigi never knew his father, who was killed by fascists on a Greek island. Today, Matteo Salvini — an avowed racist, nationalist, and Euroskeptic (not to mention a confidant of Steve Bannon, who now resides in Rome) — has come to power in Italy (see this Fox news account of one of Salvini’s campaign rallies from earlier this year). The Italian papers reported yesterday and the English news media is just beginning to file its reports on Salvini’s freshly forged alliance with Viktor Orbán, the hardline anti-immigrant and openly anti-Semitic prime minister of Hungary. Together, they plan to re-write the EU’s rules on immigration — Salvini and Orbán’s shared cause célèbre. Before he cleaned up his act and tried to affect an air of respectability, Salvini was renowned in Italy for his overtly racist rhetoric. In 2009, he proposed (as a joke, he later claimed) that foreigners riding the subway in Milan be forced to wear stars on their clothing to denote their immigration status. Even when I’m Italy teaching for an Italian university, I’m technically an extracomunitario, an alien. Will he require that I wear a star when I take the train? It makes me think of my first trip to Italy, in 1987 when I studied the history of Italian language at the University of Padua. I’ll never forget meeting and interacting with other foreign students from the Middle East and Africa then. I can only imagine, with dread, how they perceive Italy’s current political climate. I can hardly fathom their concern for their children’s futures. When I saw Luigi last month in Milan, where he is living permanently now, he told me that he doesn’t recognize the Italy of his adolescence, a time when economic prosperity and liberal attitudes locked arms to create a culture of hope, tolerance, and humanism there. “If only you would show some sign of piety, then virtue against rage will take up arms, and battle will be short, for all that ancient valor in the Italian heart is not dead” (translation by Mark Musa). Hope still shines in the distant future, dimmed and diminished but still flickering. Let us pray that the not-so ancient valor in the Italian heart is not dead.